We know that New Mexicans are concerned about animals and appreciate legislative leaders who value animals in our society. 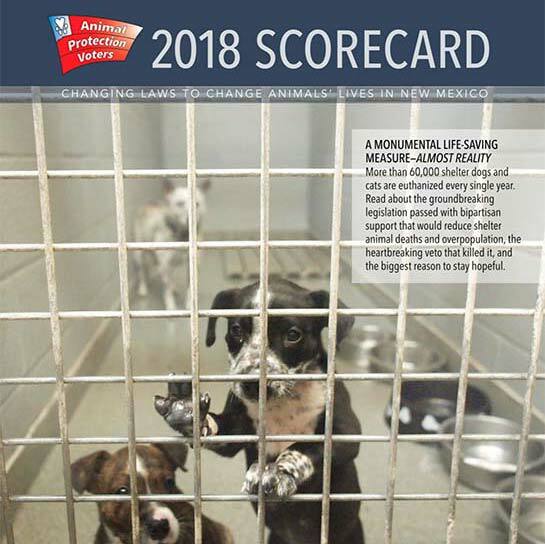 That’s why Animal Protection Voters publishes an annual Scorecard—so that voters across the state can determine if their legislators share their humane values. The APV Scorecard grades legislators based on how they voted on a number of animal protection bills and memorials introduced during this particular session. We want to give legislators credit for stopping harmful bills during the committee process, so we’ve included a number of committee votes this year. The final score represents the percentage of time that a legislator voted to protect animals when given the opportunity. While useful, the scores included here provide only one facet of each legislator’s stance on animal protection issues. Legislators can work behind the scenes to either kill or promote a bill. Committee chairs can help or hamper a bill’s progress and likelihood of success. Moreover, legislators don’t get to vote on every issue. Please keep all this in mind when reviewing the Scorecards! Find your two legislators on the scorecard—you have one in the House and one in the Senate. Please visit nmlegis.gov if you are not sure who your legislators are—a quick search on the Legislator Lookup page using your residential address will easily identify the State House District and State Senate District in which you live, which legislators represent those districts, and their contact information. Depending on your legislators’ scores, contact them right away to thank them for their positive votes, or politely express disappointment in any bad anti-animal votes and ask for a meeting to discuss their concerns. REMEMBER: Lawmakers need to know you are paying attention to their voting record. Never take our champions’ support for granted, and never write anyone off—animal protection measures come in many forms, enjoy bipartisan support, and have immense public support, so use that to your advantage. Download All Scorecards, including the 2018 Edition!